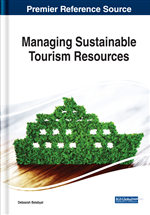 Sustainable tourism has been a focus of tourism worldwide. As the hospitality industry is a part of tourism which includes hotels and resorts and contributes a lot towards food and lodging, sustainability is a concern for the industry. Individuals have a perspective that hotelier's relationship toward environmental and societal concerns is rather secluded and intangible. Considering the size and the rapid growth of the hospitality industry, it makes it clear that environmentally sustainable action is essential. For sustainability to be effective, the best way is to engage the people from local communities. The aim is to promote socio-economic development of the tourist destination and the community considering the ecology best cared for by the locals. Tourism has to be developed in a manner so that the ecosystem is conserved with diversification of the economy leading to dispersal of ownership.